Snorkeling Bonaire Is The Best!!! I have to say snorkeling Bonaire, is hands down the best! I have snorkeled in Florida, the Bahamas, Curacao, Aruba and Bonaire. Bonaire is "known" as a diving destination, but the snorkeling is amazing. The fish are fantastic as well as the corals. 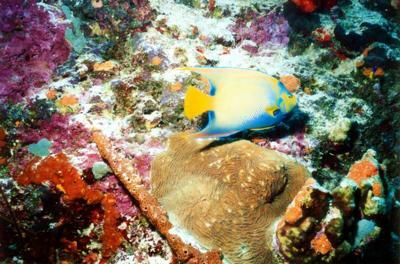 Bonaire has the largest varied species of fish in the Caribbean. The shore entries are very easy and the whole west coast is where you can snorkel. My two favorite snorkeling spots are Windsock and Tori's Reef. There are over 60 "snorkeling" sites on Bonaire. It is possible to see squid, sea horses, and various types of turtles. My favorite fish to see are the banded butterfly, french and queen angels. The south end of the island has a tremendous amount of soft corals and the reefs are very close to shore, so you see a lot in 5 feet of water! The water is also crystal clear, so you can see the bottom, up to 100 feet on a good day. It is also really cool when you can spot pods of dolphin or a manta ray! You can also book guided snorkel trips, or snorkel off of a boat. It is one of the best places in the world! Comments for Snorkeling Bonaire Is The Best!!! Bonaire Snorkeling Here We Come! Oh, that has got us excited. We are thinking about visiting Bonaire for it's snorkeling this spring. We are also thinking about visiting the other two islands of the ABCs, Curacao and Aruba. How would you compare them to Bonaire? We went to Bonaire to snorkel and have added these pages of information to this site. We spent a month on Bonaire in 2009, and although we are very avid snorkelers and went out every day, it was somewhat disappointing. First, storm surge has taken the once-incredible staghorn and elkhorn corals and piled them as rubble on the iron shore. Second, it's the Caribbean, where about 300 species of fish constitutes the lot. After Bonaire, we went to the Red Sea in Egypt, and there were literally more than 10 times the species, 10 times the abundance, and far more color. Bonaire is good because the water is perfect, and there are many places to try, although they're all pretty similar in the grand scheme. It's also easy to access from the east coast. But don't expect "Best in the World", or close to it. Are there any comments during 2015-2017? These are outdated. I am not sure to trust them. Hello ChulaSagurto, there is a November 2015 trip report on the site. Maybe that will help you. We hear from our readers all the time that the snorkeling on Bonaire is still great, as long as you know where to find the healthy reefs, which our Bonaire Snorkeling Guide shows you.